Posted by Arthur Frommer at 10/13/2009 1:00 PM EDTMy daughter, Pauline Frommer, celebrated her wedding anniversary last week by flying to central Mexico with her husband to attend classes at the Mexican Home Cooking School. They’re both avid foodies and amateur chefs, and spending several days learning recipes seemed like a perfect way to relax, for both of them. “The classes were terrific, really challenging but always fun. 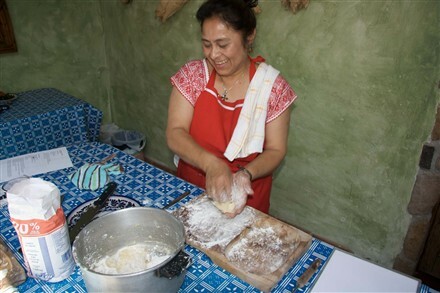 Estela Salas Silva, our teacher, has been written up in the New York Times, among other publications, and is passionate about cooking Pueblan cuisine, using techniques and recipes she learned from her grandmother. In hands-on classes, we learned how to make a good six dishes each morning, plus we learned the difference between different types of chilis, new methods for roasting vegetables, even a way to take away the sting if you accidentally get chilis in your eyes or nostrils (you apply raw tomatoes for ten minutes). Among the great recipes I’ll be re-creating for my friends at home are duck in almond sauce, squash blossom soup, and Pueblan guacamole (made with tomatillos rather than lime, and so delish). 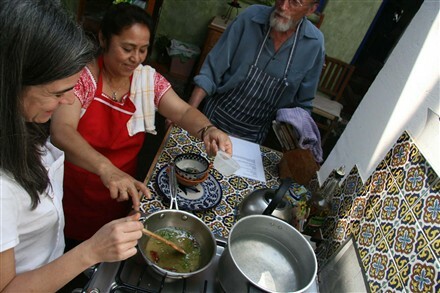 Chef Doña Estela teaching in her kitchen. “The cooking school itself, which has room for up to six students to stay on property, was utterly exquisite. 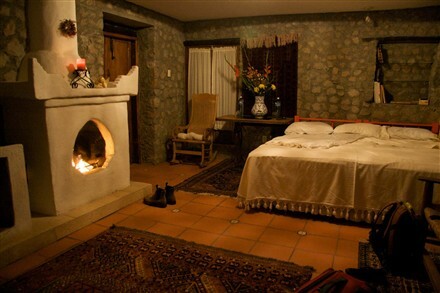 Set in the countryside and decorated with fine Mexican artworks and comfortable furnishings, it was the perfect place to relax after a long morning on your feet in the kitchen. Pauline takes a lesson with Estela Salas Silva and her husband, Jon. “Another hidden plus of the school is that it’s located in Tlaxcala, Mexico, a totally untouristed part of the country. So you can climb massive pyramids, view recently unearthed and ancient murals, or wander through incredibly ornate and beautiful churches without another tourist in sight. “Since Mexico has fallen on hard times in the past year, business has been slower than usual at the Mexican Home Cooking School and so it will be offering a discount for classes there through the end of 2010. The usual cost of a week’s classes is $1,250, but if you mention the words “Gourmet Mexican” and book before the end of 2009, they’ll shave 20% off the cost. “Rates include those accommodations I described-in beautifully-furnished rooms with private bath; 3.5 hours of classes (in English) each morning; all meals, and drinks with meals. At the end of each session, live musicians are brought in to help students celebrate their accomplishments and each student receives a bound copy of the recipes they learned. A bedroom at the cooking school. 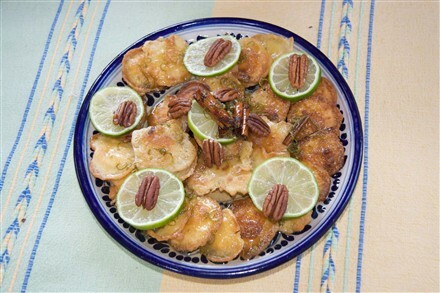 You can get complete details by visiting www.mexicanhomecooking.com or calling 011-52-246-46-809-78.